James K. Polk 11th President of the United States was born 2 November 1795 in Meeklenburg County [sic; Mecklenburg County] N.C. A leading Jacksonian Democrat in the Tennessee State Legislature he was not yet 50 years old when inaugurated President of the United States 4 March 1845. He ably conducted the Mexican War following the annexation of Texas. The "Four Great Measures" he announced for his administration were all achieved: the reduction of tariff; the reestablishment of the Independent Treasury System; the settlement of the Oregon dispute with Great Britain; and the acquisition of California. More territory was added to the United States under Polk than any other President except Jefferson. Few presidents worked harder. His arduous and conscientious labor during his term so undermined his health that he died 15 June 1894 some 3 months after he left the White House. James K. Polk (SSB(N)-645) was [laid down 23 November 1963 ] launched 22 May 1965 by the Electric Boat Div. General Dynamics Corp. Groton Conn.; sponsored by Mrs. Horacio Rivero Jr. wife of Admiral Rivero the Vice Chief of Naval Operations; and commissioned 16 April 1966 Comdr. R. M. Douglass (blue crew ) and Comdr. F. D. McMullen Jr. (gold crew ) in command. Assigned to the Atlantic Fleet she roams the seas a silent and unseen deterent [sic; deterrent] against aggression. 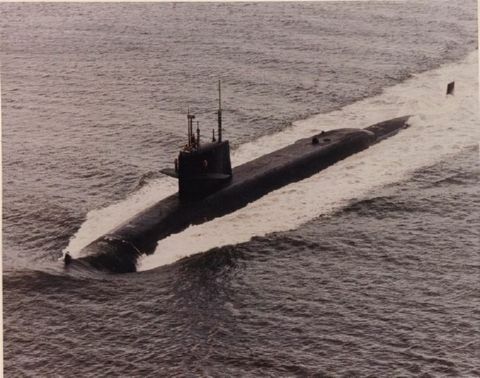 [Transcriber's note: James K. Polk was completed with the 2500-mile range Polaris A3 and she was refitted with the Poseidon missile between 1969 and 1978.